Coconut milk has recently gained a lot of popularity. Vegans from different parts of the world are in love with coconut milk and have made it a major ingredient of their diet. It is a tasty alternative to cow’s and buffalo’s milk and it provides an array of health benefits to human health. What is Coconut Milk & how is it obtained? Coconut milk is a thick, creamy and rich white-colored liquid obtained from the inner white flesh of mature coconuts, which are brown in color on the outer side. It is a traditional part of the Southeast Asian cuisine and is widely used in their various food preparations. Just like its other relatives; coconut oil and coconut water, coconut milk is among the world’s healthiest super foods. Note: Do not confuse coconut water with coconut milk. Coconut milk is obtained from the inner white coconut meat. Here are some evidence-based health benefits of coconut milk. Let’s have a detailed look at what research has to say about coconut milk. When it comes to cholesterol, people often think that coconut milk is a rich source of saturated fatty acid and it may be unhealthy, but this is not true. Though this milk contains saturated fat, it does have other healthy compounds in it that help in the management of cholesterol. Having an altered lipid profile puts a person at an additional risk of developing heart diseases and stroke. Coconut milk helps in increasing the HDL cholesterol, which is also known as the good cholesterol and reduces the ‘bad’ LDL cholesterol. Coconut milk comprises of medium chain fatty acids (MCFA). During the process of digestion, MCFA are easily broken down and absorbed in the body. They can be converted to ketones, which are an alternative energy source for the brain. Ketone bodies are beneficial for individuals with memory impairment, as seen in Alzheimer’s disease. Deposition of a protein called ‘amyloid’ in the brain, causes degeneration of brain cells and leads to cognitive decline and Alzheimer’s disease. Ketone bodies help in reducing the amyloid levels and further protect against neuronal damage. Gastric ulcers are painful sores that develop on the inner lining of the stomach. Studies have observed that coconut milk has a soothing effect and it helps in ulcer control. This milk reduces the size of the ulcer by combating the negative effects of pro-inflammatory compounds. C-reactive protein is an inflammatory marker that induces gastric inflammation and is associated with higher risk of gastric ulcers. Coconut milk helps in lowering C-reactive protein and counteracts its negative effects on the health. It further increases the production of mucus, a slimy layer that coats the inner lining of the stomach and protects against the onset of ulcers. Compounds present in coconut milk exhibit strong antioxidant properties. The maximum of its health benefits are attributed to its antioxidant action. A glass of coconut milk along with other antioxidant-rich foods may boost the immunity and rebuild the damaged cells of the body. Oxidative stress is associated with increased risk of diseases. Being rich in antioxidants, coconut milk scavenges the free radicals, breaks their chain reaction and suppresses oxidative stress. It prevents free radical damage and protects the healthy cells of the body against destruction and death. Coconut milk is an effective agent, when it comes to fighting bacterial and viral infections. Such a property of this milk is attributed to the presence of ‘lauric acid’ in it. Lauric acid is a medium chain fatty acid, which in the body gets converted to ‘monolaurin’, a highly beneficial compound. Coconut milk benefits to support heart health by lowering the bad cholesterol and increasing the good cholesterol. Antioxidants present in it inhibit the oxidation of LDL cholesterol and decrease the formation of atherosclerotic lesions. Besides this, coconut milk contains essential minerals like potassium and magnesium, which help in keeping the blood pressure under control. These minerals further help in controlling the electrical activity of the heart and play an important role in every heartbeat and contraction. Because coconut milk contains so many compounds that are vital for heart health, it should definitely be on your food list. Coconut milk is a popular choice among individuals with lactose intolerance. Unlike cow’s and buffalo’s milk, coconut milk does not contain lactose, hence such individuals can easily substitute dairy products with products made from coconut milk. Homemade coconut milk is a perfect choice. If you don’t prepare it at home, you might have to buy it from the market. Now, here starts a problem. Canned coconut milk may contain Bisphenol-A (BPA), which is not good for the health. Is coconut milk a dairy or a non-dairy product? Because it is called coconut ‘milk’, some people may think of it as a dairy product, but it is completely different from a dairy product. As mentioned above, coconut milk is obtained from the inner flesh or meat of the coconut, and it is not derived from the milk of animals. In fact, it is a healthy and delicious alternative to cow’s or buffalo’s milk. Coconut milk is a healthy milk with a rich, creamy texture and a natural sweet taste. The presence of proteins, healthy fat and health-promoting compounds in it makes coconut milk is nourishing liquid. It has great ability to fight against infections, heart diseases, gut issues and boosts immune system. Coconut milk benefits in the prevention of Alzheimer’s Disease, ulcer and heart disease. Because coconut milk offers so many health advantages, it is definitely healthy. Note: Anything in excess is unhealthy, even water! Coconut milk when consumed in the right amount, for example 1-2 servings per day in the form of milk and coconut yogurt is beneficial for human health. Coconut milk is obtained by squeezing the inner flesh of the coconut. Because it comes from a plant, it is 100% vegan. This dairy-free milk can be safely consumed by vegans all around the world. Is coconut milk good for hair? Besides, improving the health of your inner organ systems, coconut milk is beneficial for your hair too. This multi-purpose miraculous milk promotes hair growth and enhances the texture and appearance of the hair. Essential nutrients present in coconut milk help with the treatment of dry and itchy scalp. Coconut milk also acts as a natural hair-conditioner, which adds volume to your hair and prevents hair fall too. 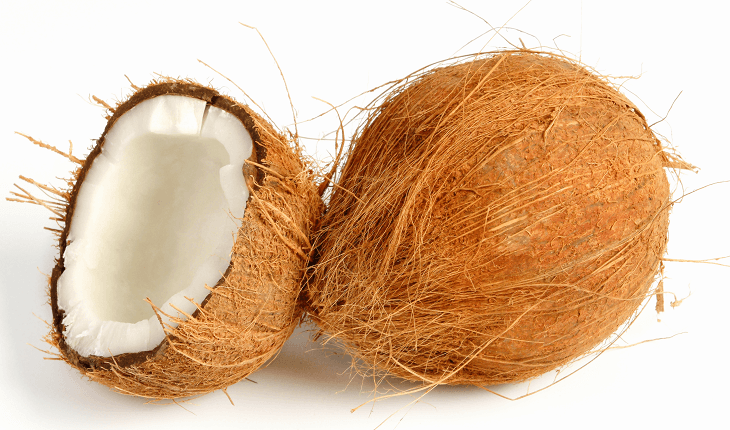 Is coconut milk good for diabetics? Unsweetened- no added sugar, home-made, low-fat coconut milk is suitable for diabetics. Is coconut milk lactose free? Lactose is a sugar present in the milk, obtained from the animals. Because coconut milk comes from a plant source, it does not contain lactose and it is completely safe for individuals with lactose intolerance. How many calories are present in coconut milk? 100 ml full-fat coconut milk contains 230 calories. Can you heat coconut milk? Coconut milk tolerates heat and you can heat or boil it. However, boiling it for a long period of time will make it thicker and creamier due to its high fat content, so pay attention while you boil it. Hence, coconut milk can be easily used for the preparation of hot coconut milk-based beverages. Can you drink coconut milk every day? Yes, healthy individuals can drink coconut milk every day. Because it is high in calories and fat, one should be mindful about the portion size. You can consume 1 serving of coconut milk per day. Individuals who are underweight can even consume 2 servings per day. What can I cook or prepare with coconut milk? What desserts can you make with coconut milk? What can you bake with coconut milk? You can easily replace cow’s milk or cream mentioned in a recipe with light or full-fat coconut milk. All you need to do is read the recipe carefully. Substitute coconut milk in equal parts as mentioned in the baking recipe. If the recipe requires cow’s milk, you can replace it with light coconut milk. If the recipe requires heavy cream, you can replace it with full-fat coconut milk. You can use coconut milk to bake cakes, cookies, tarts and puddings. Can coconut milk help you lose weight? Coconut milk intake along with caloric restriction may help in weight loss. Coconut milk contains fat in the form of Medium Chain Triglycerides (MCTs). MCTs are easy to digest and they are not stored in the body. It suppresses appetite and thus, it reduces food intake and entry of excess calories into the system. Hence, coconut milk can help in weight control. Note: Be mindful about how much coconut milk you consume. Excess of anything is not good. How much coconut milk can we take per day? 1 serving per day for healthy individuals and 1.5-2 servings for individuals who are underweight. What is size of 1 serving of coconut milk? The standard size of coconut milk serving is 150 ml. Dt. Sneha Sadhwani Sewlani (B.Sc. Food Science & Nutrition, PG in Clinical Nutrition & Dietetics) is Clinical Nutritionist & Certified Diabetes Educator and Certified Lifestyle Coach. She has expertise in clinical nutrition and 4 years’ experience working as Clinical Nutritionist and Dietician. She has been associated as a nutritionist with LTMG Hospital and S. L. Raheja Fortis Institute in Mumbai. She has also her own private practice where she offers a wide range of different programs, including weight loss, weight gain, diabetes management, diet plan according to diseases and much more through her in-person and online consultation. Sneha strongly believes that a healthy diet and lifestyle modifications are the best ways to prevent and treat diseases. She says, “Eating healthy is an art, be an artist of your own mind and body”.